An artist's illustration of Lockheed Martin's crewed lunar lander, which is designed to let astronauts spend two weeks at a time on the moon's surface. Founder of the Mars Society Robert Zubrin, who has long sought to push humanity toward missions to the Red Planet, has a new idea to send astronauts to the moon faster and cheaper than NASA can. Those travelers would then mine the lunar surface to kick-start a cosmic economy. The Moon Direct plan, which Zubrin laid out in today's edition (Oct. 31) of the journal The New Atlantis, aims to send astronauts directly to the moon, rather than making a pit stop at NASA's planned Lunar Orbital Platform-Gateway. That space station would orbit the moon and serve as an outpost for crewed missions to the moon, Mars and deep space. "If we want to explore the moon and prepare to go beyond, we don't need a space station in lunar orbit — but we could use a base on the moon itself," Zubrin said in his Moon Direct plan. "A moon base would be much more than a stopping point." In August, astronomers announced the discovery of water ice on the lunar surface. Mining this natural resource could produce material for hydrogen-oxygen rocket propellant to fuel return trips to Earth, Zubrin said. 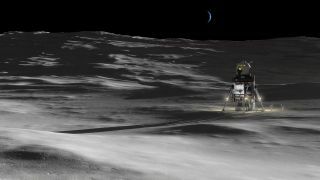 Also, it could fuel lightweight lunar excursion vehicles (LEV) for long-range surface trips that would allow astronauts to explore additional areas of the lunar surface more efficiently, Zubrin said. "This is a powerful propellant that has been a mainstay of rockets for decades, used by the Saturn V and the space shuttle," Zubrin said. "Mining this water and electrolyzing it into hydrogen and oxygen would allow vehicles to refuel on the moon. This would provide the means not only to return from the moon, but also to travel from place to place on the moon, thereby markedly lowering the ongoing cost and increasing the capability of a sustained lunar-exploration program." Specifically, Zubrin recommended building a lunar base near the moon's poles, which is where water was discovered in shadowed craters. This area also receives the most sunlight, meaning there is a greater potential to harvest solar energy. Sending astronauts directly to the moon will also reduce any liabilities of maintaining a space station in lunar orbit and reduce the risks to astronauts, Zubrin said. "For the same reason that on Earth we always see the same side of the moon, viewed from the surface of the moon, the Earth is always at the same place in the sky — so the window for the return launch is always open," Zubrin explained. However, if we were to use the same lunar orbit rendezvous flight plan that Apollo employed, the launch of the lunar module from the moon's surface would need to be perfectly timed. This would be necessary in order to connect with the orbiter and successfully return to Earth. "Further, because the moon lies largely beyond the protection of Earth's magnetic field, astronauts stationed in lunar orbit will receive unnecessary doses of cosmic radiation, violating the principle that radiation doses should be kept as low as reasonably achievable," Zubrin said. "In contrast, there are vast amounts of shielding material readily available on the moon." Therefore, rather than maintaining a space station in lunar orbit, Zubrin recommended using the LEV to transport astronauts to and from the moon. The LEV would leave the moon and rendezvous with spacecraft in low Earth orbit, such as the International Space Station. In this case, the LEV's crew would transfer to the space station before returning to Earth, and the LEV would refuel and then be used to take another crew back to the moon. The Moon Direct plan would consist of three choreographed phases. The first step would require an uncrewed mission to the moon to deliver materials for building the lunar base. Next, crews would fly to the moon to set up the base and begin producing the hydrogen-oxygen propellant. Next, the final, long-term stage would involve recurring piloted missions using the propellant produced on the moon. Zubrin argued that one major benefit of his Moon Direct plan is that it would use systems that are either already available or could be readily adapted from existing technologies. "The moon itself, not lunar orbit, is where we can do things. It is the potential site for human ingenuity and achievement, the place where resources and discoveries await," Zubin said. "Moon Direct would give NASA, for the first time in decades, a human space program with a clear purpose. It would not only provide valuable experience and insight for an eventual Mars mission, but would [also] give a badly needed boost to public confidence that America can and will remain a nation of pioneers." A digital copy of Zubrin's full Moon Direct article is available online in The New Atlantis.